I'm a librarian in Washington state. I'm a fan of philosophy, sociology, young adult literature, graphic novels, macabre lit and more. The question, "What would you do if everyone was no longer safe on the planet earth?" is answered by a scientist who concludes that the only hope for humanity is to send a bunch of teenagers into space. 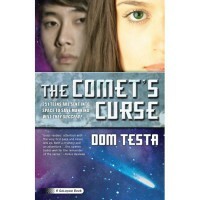 That is essentially the premise of The Comet's Curse (Galahad Series Bk. 1). The earth is casually orbiting the sun, when a comet, like a proverbial black cat crosses its path, showering the earth and a cloud of comet dust. Many find the phenomenon to be beautiful, but it turns out to be deadly, as the dust somehow contaminates the atmosphere and introduces a wholly foreign virus to the human race. The virus only seems to infect those who are 18 or older, and civilizations crumbles as people realize their days are numbered. When a scientist proposes the plan to send young colonists into space with a mission to colonize a potentially habitable planet, many support him and others fight against him. Triana is the young captain of the Galahad ship, and the story reveals a love triangle between her and two of her crew. A mystery develops when another member of the crew is taken to the infirmary after having a nervous breakdown, shortly after the departure of the Galahad. I found the most engaging character to be the ship itself. Or rather, the computer "brain" of the ship called "Roc." It was witty and engaging, and gave the reader some comic relief. Gap, the second in command of the Galahad crew, came in a close second. The pacing felt sluggish in the middle of the book, and while many praise the characters of this book, I found Triana, who is the leader and at the center of the politics of Galahad, to be lacking in interesting qualities. Overall, the book had an interesting premise, and an engaging overall goal. I'm not sure when I'll be able to pick up the other books of the series, but I'm hoping that they get better as they progress, as they were picked up by Tor Publishing a few books into the series.